Twenty-one Silver and Bronze level Award participants of Emmanuel Ministries, Kolkata completed their Adventurous Journey at Susunia Hills from 14th to 17th March 2016. A report by Timothy Barretto (Award Leader) follows. 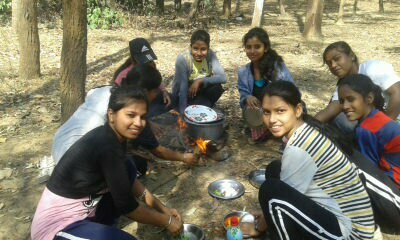 Thirteen Silver level and Eight Bronze level Award participants (10 girls and 11 boys) of Emmanuel Ministries, Kolkata started their Adventurous Journey on 14th March 2016 to Susunia Hills, West Bengal. The group was escorted by Timothy Barretto (Award Leader) and Munna Barik (Community Teacher) along with four experienced instructors of the Institute of Climbers and Nature Lovers (ICNL), Kolkata. To begin with, the mentors briefed the participants about the basic requirements and information pertaining to travelling and discipline. After the overnight journey from Howrah station to Chaatna station the group trekked to the campsite in Susunia (11 kms) for 2 hours and 45 minutes. The group reassembled at 11 am and were introduced to the first practical class “Rope Knots”. The key to this class was “Easy to tie knot and easy to open”. Every type of knot was demonstrated and the purpose of each knot was described. The next activities to follow were the single rope bridge, monkey crawling and Jummering, which were novel experiences, especially for the Bronze participants. These exercises were centrally focused on team building and capacity building, giving the participants an impetus to achieve and a feeling of exhilaration and stimulation. The day drew to an end with an inspiring session on mountain manners and self-motivation by instructors. The next day the participants trekked to an altitude of 1600 feet up Susunia hills. The instructors briefed the students about the basic techniques of Rock Climbing. The participants formed groups according to their levels and each one had to do climbing, rappelling, traversing and chimney climbing. This turned out to be one of the best experiences for the participants, many of whom said that they were able to conquer their fears after their first climb. In the second half of the day they were taught about Tent Pitching and Tyrolean Traverse. A camp night was organized to add to the fun and amusement.